Here is the Porsche 911 Carrera RS. It’s a 1/64 scale made by Kyosho. Yes, Kyosho makes small scale cars too. From 1:64 to 1:100 scale. I am more of a 1:64 scale collector, and Kyosho makes the best 1/64s in the business. No other manufacturer can beat the sheer quality and detail of a Kyosho. It’s really an impressive effort on something that can fit on the palm of your hand! 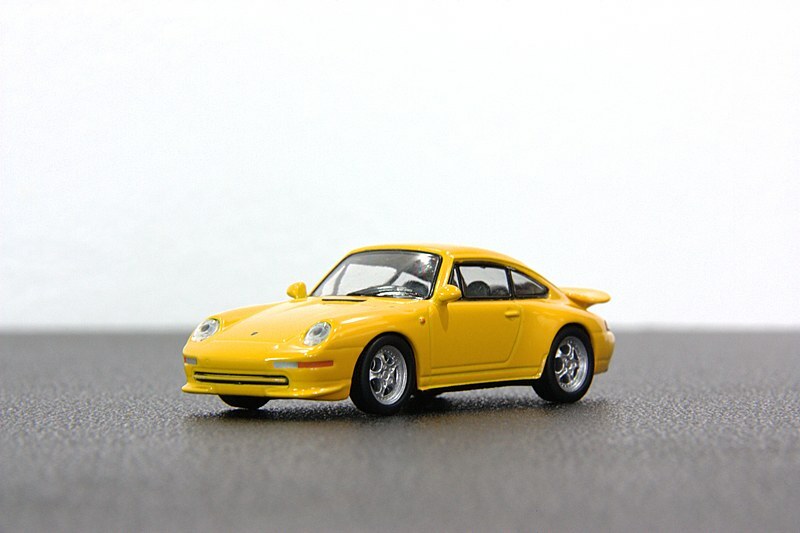 This model is part of the Porsche Minicar Collection III. It also comes in Silver and Black. 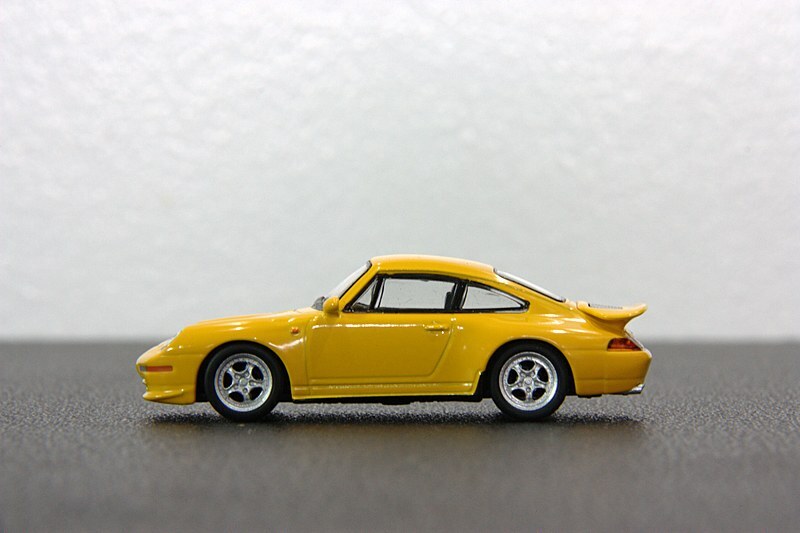 Well, whatever color you choose, the 993 Carrera RS is a true beauty, with the real one being a collector item (as with all 993 model Porsche 911s). So, Carrera RS? I’m sure most people of this generation haven’t heard of it. They hear mostly “GT3” “GT3 RS” or “GT2” from the modern 996 and 997 models (even the current 991 model already has a GT3 model). The “Carrera RS” harks way back in 1973, as a homologation model to compete in the FIA Group 4 class. Porsche built an exceedingly high amount of units available, hence automatically making this car eligible. The 993 Carrera RS was the last of the series. Yep, it is the last. Only 3 incarnations of the legendary name have spawned – F series, 964, and 993. Knowing that the 993 lineup is the last of the air-cooled Porsche 911s, it has quickly turned into collector’s pieces, with the Carrera RS being the most sought-after, along with the Turbo. The air-cooled flat-6 engine sound is just sensational, it is distinct. It may not be as loud as Ferrari or Lamborghini, but this defines a 911. Performance figures are still astonishing in today’s standards. With 300 horsepower, transferring to the rear wheels only via a six-speed close-ratio gearbox, the Carrera RS can perform 0-100 KM/H in just 4.7 seconds and can go to a top speed of 280 KM/H. Those performance figures can even match the Jaguar XK and it’s even close to the BMW M3! Being an RS model, the weight has been reduced, with carpeting and electronic windows being done away with. One can also opt for the “Clubsport” package which deletes further luxury equipment such as aircon and stereo, as well as a larger rear wing and a deeper front chin spoiler to distinguish it apart from the “regular” Carrera RS. Now, back to the model above. Kyosho put in an impressive effort in detailing the car. It has signal and side light tampos, plastic head and tail lights, and even an accurately written “Carrera RS” badge at the back! It has rubber tires, and side mirrors moulded to the body, so do not fear of any easily removable small parts from this model. However, one must be careful, as Kyosho 1/64 paints can be worrying. The matte painted black side skirts has paint that can be easily scratched off. Another downside? The price. One must pay a lot for that exquisite detail. Expect around 10 USD at least, plus getting one can be difficult. Kyosho’s distribution is rather small. eBay is a great source for Kyosho 1/64s, but expect to see sky-high prices. Where I get them is from different stores in a mall nearby my home, however new ones rarely pop up, because of that aforementioned distribution issues. Overall, it is a really great model to buy. A Kyosho 1/64 can be a great line to have with, but it is an expensive one. But it makes the likes of Hot Wheels and Matchbox models shake their boots when they see one. And a 993 model Porsche 911? Who can resist its beauty?